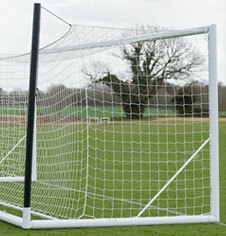 A range of senior and junior freestanding Eurogoal and Portagoal goalposts for natural or 3G synthetic pitch surfaces. Suitable for club, 5v5, 7v7, 9v9 leisure, university or professional sports grounds. Powder coated 102mm x 112mm x 2.2mm alloy and tubular steel with demountable and integral weighted models. Folding and hinged options. Optional lifting and transport wheels are available. Price is per pair of goals. For use with appropriate FPX goal nets. We offer schools, universities and public sports centres a nationwide football goalpost and equipment installation service. This includes ground socketed and freestanding steel goalposts, football ball stop netting perimeter systems, non turf artificial outdoor football pitch surfaces and outdoor all weather coach shelters. Heavy duty portable steel freestanding steel goalposts. Aluminium 3G freestanding Portagoal goalposts. Aluminium freestanding 3G Euro Goal goalposts. Demountable freestanding 3G aluminium goalposts. Self weighted freestanding 3G aluminium goalposts. Integrally weighted 3G aluminium goalposts. Aluminium folding hinged freestanding 3G Portagoals. Hinged folding freestanding 3G aluminium goalposts.